At Annabel restaurant in New York City, chef Manuel Honrado gives pizza a fresh twist with the addition of housemade blueberry chutney. The pizza toppings also include duck prosciutto, ricotta and arugula. 1. Prepare chutney: In large saucepan, combine blueberries, sugar, balsamic vinegar and thyme; bring to a boil. Reduce heat to simmer and cook down for 1½ hours. 2. Strain blueberries and set aside. Continue cooking until liquid is syrupy in texture. Add blueberries back to syrup; blend with a hand blender until pureed. 3. Prepare pizza: Bake pizza crust. While still warm, top with ricotta cheese; place in oven for 1 to 2 minutes until cheese melts slightly. 4. 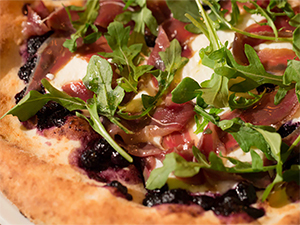 To serve, spoon blueberry chutney around edge of pizza; top with prosciutto and arugula.